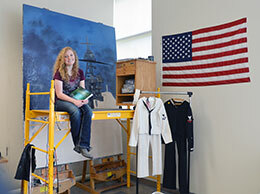 Minors are also available in all concentrations and museum studies. July 14, 2016 — There was a time Cassidy Newkirk, a self-described “ranch kid,” was told by her high school teachers she would never amount to much pursuing her love of art. March 2, 2015 — Ecology and art will converge for two University of Wyoming professors who want to create a little buzz about the science of bumblebees by using a little creative expression.